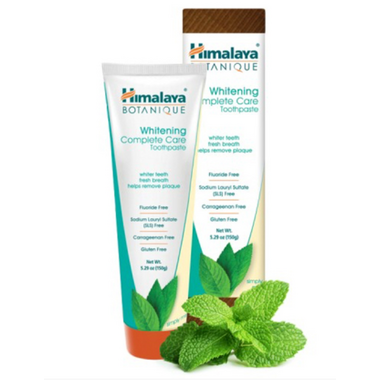 Himalaya Botanique approaches oral care a little differently.They combined Neem leaf, harvested from ‘the worlds most researched tree’ and combined it with the most popular formula in all of Ayurveda – the three renewing fruits of Triphala, along with the powerful pomegranate fruit to create something noticeably different. In Bontanique's Whitening toothpastes, Papain and Bromelain, the enzymes from papaya and pineapple, help remove surface stains, so your smile shines brighter than ever! I have had such a hard time finding a good natural toothpaste that my husband would like the suds and taste of. Iâ€™ve tried so many and he loved this one immediately and I love that thereâ€™s no sls in it. I absolutely love this toothpaste! The mint is strong and fresh, the consistency is exactly what I want in a toothpaste, and my mouth feels so clean when I'm done. I will definitely be buying this again! I love this toothpaste. Tastes great, actually gets rid of plaque, not so much for whitening as my teeth bone is yellow, and use only a tiny amount as it foams a lot. Tastes great and refreshing and teeth feel like they have been polished! This is my favourite toothpaste. It has a great taste and my teeth feel polished. Excellent produit. Haleine fraÃ®che qui dure longtemps!